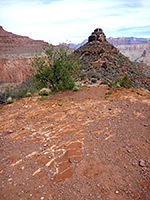 Of the six rim to river routes along the South Rim of the Grand Canyon, the Hermit Trail is intermediate in difficulty - less used and in places more testing than the popular Bright Angel and South Kaibab trails, but still with some facilities, a generally good surface underfoot, and a developed trailhead, unlike unmaintained paths such as Tanner or New Hance. But with a distance of 9 miles to the Colorado and an elevation change of 4,340 feet this is still a very strenuous route, one not normally done as a day hike. Most people stay for at least one night at Hermit Creek Campground (BM7), a primitive facility 1.5 miles from the river, for which reservations are required some months in advance. One negative aspect of the trail is the amount of noise from sightseeing helicopters, as this part of the Grand Canyon is within the zone where such flights are permitted. 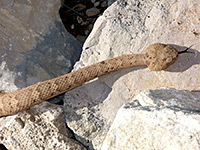 There are two targets for a shorter day trip along the Hermit Trail. 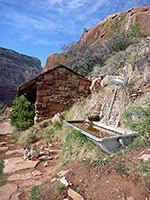 One is Santa Maria Spring, a permanent water source next to a stone shelter with benches, which is reached after 2 miles and a descent of 1,600 feet, and has good views of the sheer red cliffs around the upper end of Hermit Creek. Another turnaround spot could be Breezy Point, 3 miles further but not much lower; this is a promontory that gives a fine panorama over the inner canyon gorge, and precedes the start of the steepest part of the descent, a series of tight switchbacks known as Cathedral Stairs. As with all similar Grand Canyon trails, the ease of hiking is greatly dependent on the time of year, and for the Hermit is best in spring, when melting snow lines the upper stretches, and numerous small seeps provide drinkable water at intervals along the first half of the route. 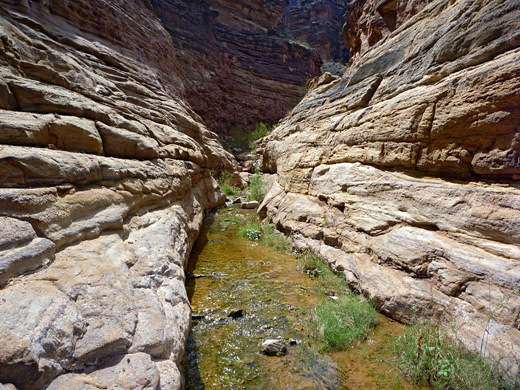 In summer, however, the canyon is very hot, exceeding 100°F in the inner gorge, and the lower half of the Hermit Trail is exposed, lacking any shade. 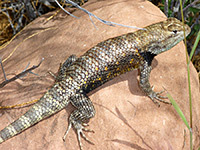 Overall, the scenery is a little more varied than for some other trails, changing from the confined, cliff-bound slopes of Hermit Basin and upper Hermit Creek, to the wide-open landscapes of the Tonto Bench, and then to the enclosed lower gorge, where Hermit Creek flows through a beautiful narrows section with pools and waterfalls, bordered by thin strata of Tapeats sandstone. The path ends at a sandy area beside the Colorado opposite Hermit Rapids, at elevation 2,350 feet - location of another primitive camping area (BM8). Early in the 20th century the Hermit Trail was a well used and well maintained route, an upgrade of an old Indian path, used to take visitors to a resort-like campground (operated by the Santa Fe Railroad) beside Hermit Creek, but is much degraded due to decades of neglect after the camp closed in 1930. Hermit Trail topographic map, South Rim location map. 28 views along the Hermit Trail; gallery, slideshow. Hermit Rapids, Hermit Creek narrows and a rattlesnake (mp4; 1:07 min; 6.8 mb). The Hermit Trail begins at Hermits Rest (elevation 6,660 feet), at the west end of the West Rim Drive, 850 feet beyond the parking area for the shuttlebus. Private vehicles are only permitted to drive here between mid September and mid May; in the busier times of late spring and summer, all day hikers have to use the free shuttle service, a journey that takes 45 minutes westbound or 30 minutes eastbound. Backpackers with overnight camping permits may drive here all year, however, after obtaining the key code to open the barrier-protected gate at the start of the road. Facilities at Hermits Rest include rest rooms, a cafe and (as of summer 2011) a free supply of drinking water. The path sets off down a lightly wooded gully, drops over the edge of the plateau, descends through the whitish Kaibab limestone via a short series of switchbacks then traverses south, staying fairly level for a while before zig-zagging steeply through the Coconino layer, and across undulating reddish hillsides of Hermit shale to a junction with the Waldron Trail, a connecting route up to Rowe Well Road on the rim. There is another intersection soon after, with the Dripping Spring/Boucher Trail, at elevation 5,200 feet. The Hermit Trail continues along a rocky drainage for a short distance, round a small pour-off then levels out, just as the drainage drops off vertically. The next section runs beneath a sheer rock face, descends via a couple of switchbacks and crosses sloping ground to Santa Maria Spring and its adjacent shelter. The spring produces quite a lot of water but the source is dispersed, and most soon seeps below ground. A small portion is channeled via a pipe into a horse trough, where drinking bottles can be filled, if the water is suitably treated. 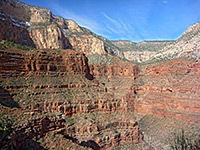 After Santa Maria Spring, the Hermit Trail remains nearly level for another 1.5 miles, traversing layers of the Supai Formation at around 4,900 feet; far below, the canyon of Hermit Creek becomes very deep, and narrow, enclosed by vertical cliffs of Redwall limestone up to 800 feet high. The path rounds a few corners, crossing occasional drainages lined with big jumbled boulders, and later curves inwards to pass a wide basin, while giving the first good views of the lower end of the creek and the Tonto Bench, before starting the next stage of the descent, dropping 400 feet to a ridge connected to an isolated promontory (Lookout Point). The views are very good now, up and down the main Grand Canyon and over several tributaries on the north side, including Ninetyfour Mile Creek nearly opposite. The lengthy switchbacks of the main part of the descent can now be seen, still quite far away, beyond several ridges. Next is another long traverse, fairly level at around 4,500 feet, even climbing slightly in a few places, passing several other promontories and descending a little to the next major ridge (Breezy Point), then soon after reaching the start of the steepest part of the trail, the Cathedral Stairs - a series of short, boulder-strewn switchbacks down a sheltered ravine through the Redwall layer, in shade early and late in the day. The path passes through a gap between some cliffs and becomes straighter and less rocky underfoot, curving across the hillside below Cope Butte and later switchbacking down an exposed, grassy slope with scattered boulders, to a junction with the Tonto Trail; to the east this climbs slightly up to a low saddle, while to the west, the path continues to descend, now more gradually, winding across hills and small ravines to another junction, signed Hermit Creek to the left (the campsite is reached in another half mile), and Hermit Rapids to the right. 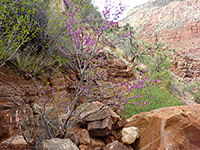 The right branch of the trail drops into the lower canyon of Hermit Creek, as the drainage starts to cut into the Tapeats sandstone that underlies the Bright Angel shale of the Tonto Bench. At this point the canyon is 100 feet deep and sheer-walled, enclosed by brownish cliffs of flat, thin-layered strata, and containing the permanent stream which forms pools, cascades and narrow channels. The path avoids these, crossing over to the north side and running along a bench a few feet above the water until the narrows end, giving way to a widening V-shaped gorge as the creek reaches igneous, Precambrian rocks of Vishnu schist. The trail stays close to the stream, rising in a few places to pass boulders and overgrown riparian sections, and ends at a sandy-floored, bushy area with cottonwood trees, right beside the river, opposite Hermit Rapids. The Colorado canyon here is not as scenic as places further east, being surrounded by rather dull-colored rocks, but is still quite dramatic.